I believed that every household’s condiment shelf has at least a bottle of soy sauce as a taste enhancer in our cooking. But there are so many types of soy sauce out there and it can be a bit confusing. 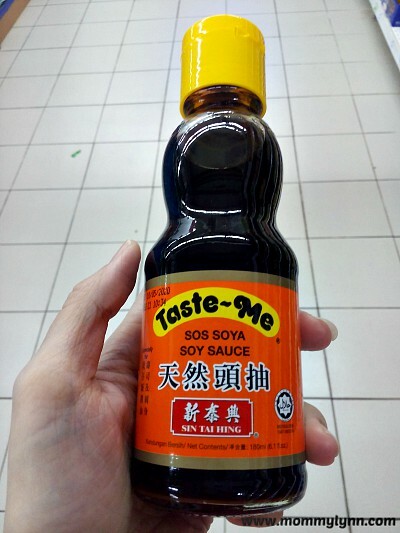 Here is some guide to the most common types of soy sauce available in Malaysia and Singapore and how to choose a good soy sauce that suitable for your kids and family. All soy sauces start with soybeans that are soaked, steamed, and then crushed into a paste which is then fermented with mold and brine, then aged naturally for 3 months or even longer. Some also include sugar or other ingredients like caramel. After fermentation, this mixture is refined, sometimes pasteurized and then bottled. The appealing and unique colour, flavour, and fragrance of soy sauce are generated by the fusion of the soybeans, wheat, and salt that are the three main raw materials. The taste is mainly from soybean proteins, and the fragrance is from wheat starch. The characteristic colour comes from the combination of amino acids, obtained from proteins, and glucose, obtained from starch. The salt suppresses the action of destructive microorganism that cause food to decay. 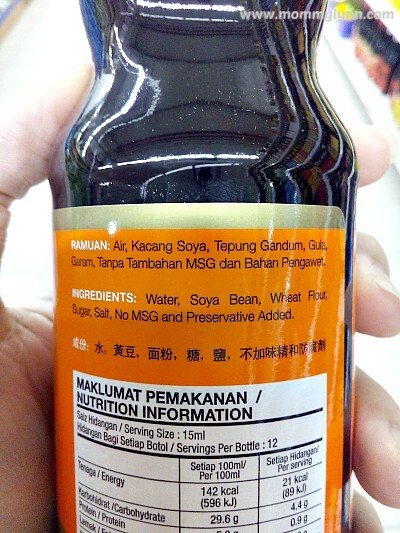 So be careful to only purchase real soy sauce that use soybeans as a main ingredient. Fake, cheaper soy sauce, sometimes dubbed chemical soy sauces, can contain hydrolyzed vegetable protein, colouring and corn syrup instead. 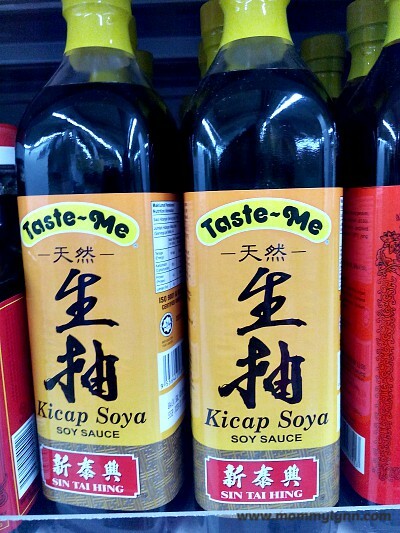 The most common type of soy sauce sold, usually just labeled soy sauce, shoyu (word of soy sauce in Japanese), 生抽 (word of soy sauce in Chinese), or kicap soya (word of soy sauce in Malay). 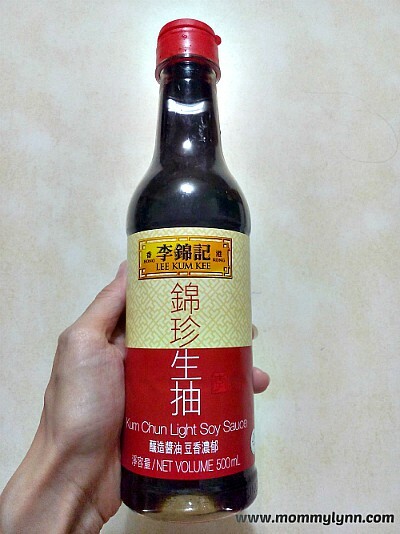 Light soy sauce (生抽) is thinner and saltier than regular or dark soy sauce. It is normally used for dips, marinating ingredients, dressing, and stir frying foods. 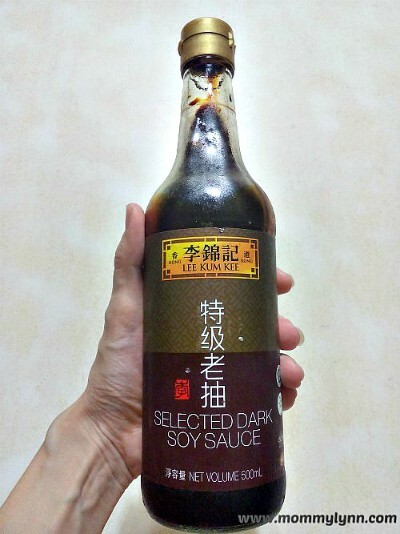 Dark soy sauce (老抽) is thicker, less salty and aged longer than regular soy sauce but has a richer flavour and darker colour due to the addition of caramel. It is used to enhance the taste and appearance of various dishes like fried noodles and braised pork, chicken, or beef with soy sauce. 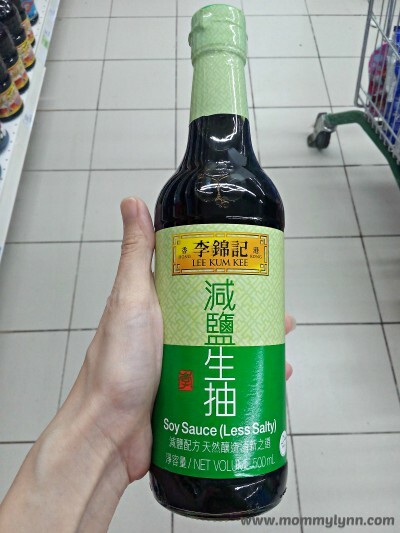 Low sodium or less salty soy sauce (减盐生抽) is brewed the same way as regular soy sauce, a lot of the sodium is removed after the fermentation process. However, it is made with extra chemicals. So diluting regular soy sauce for less sodium is recommended. 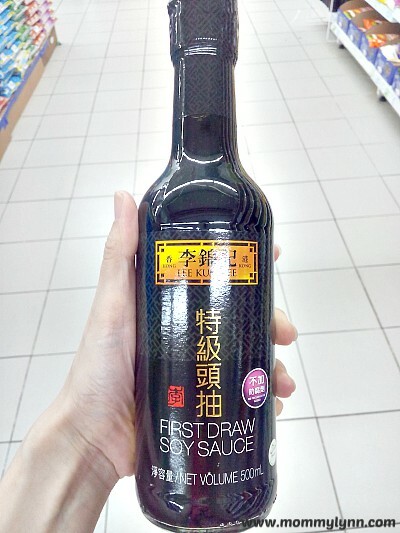 First draw soy sauce (头抽) is brewed according to the traditional method and is aged naturally for 3 to 4 months. 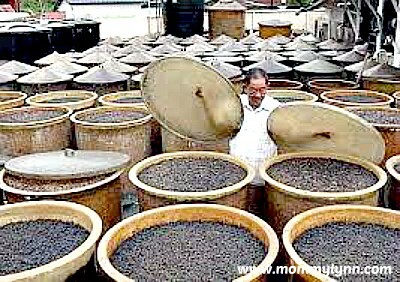 The first matured soy sauce that extracted is known as first draw soy sauce. So the colour, flavour, and fragrance are better than the regular soy sauce. It is more expensive than other soy sauces. 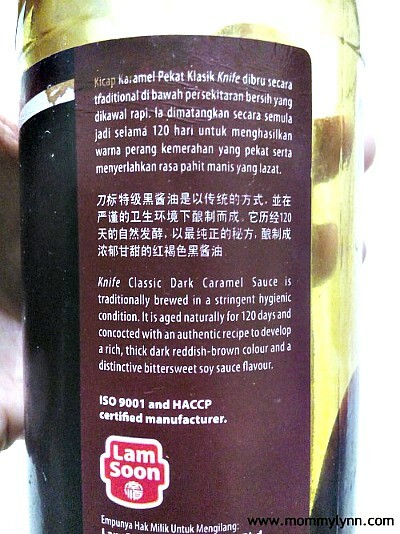 Dark caramel sauce / Thick soy sauce (黑酱油/晒油) is a rich, thick dark reddish-brown colour soy sauce with bittersweet taste. A lot of caramel is added after the fermentation process. It is normally used to enhance the appearance of the dishes. I personally like to use both first draw soy sauce and dark soy sauce to balance the colour and flavour of dishes. Besides verifying a type of soy sauce, there are other factors you should consider in order to choose a good soy sauce. Ingredients – Read the labels. Watch for artificial preservatives, flavors, and colors. Common artificial preservatives are sodium benzoate and potassium sorbate. Avoid chemically processed hydrolyzed vegetable/soy protein. How it’s made – Is it fermented? Not chemically processed? How long does it take to make? Traditional soy sauce is naturally fermented and aged for more than a several months with minimal ingredients. Now you know the basics of soy sauce how to differentiate the soy sauces. Choose the right soy sauce for your family and savor the taste of this amazing, timeless seasoning! 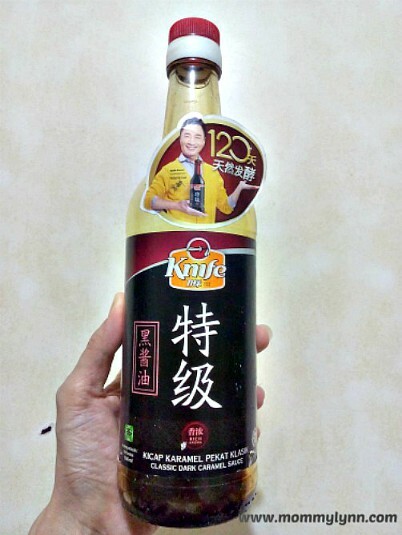 i have allergy to yeast and doctor ask me to use the first draw soy sauce from Lee Kum Kee. So, for dark soy sauce, do you know if its free from yeast as well? Does it taste less saltier than the usual soy sauce? Hi Sheryn, I tried doing some research online but I could not find the answer to your question. My suggestion is, contact Lee Kum Kee customer service. It is best to get the answer from them directly.